First, according to the most recent deliberation of the state Drought Management Task Force, Massachusetts is finally back to normal (i.e., non-drought) conditions for the first time in over two years. The cool and rainy spring we’ve had has made up the rainfall deficit we’ve been hanging on to for some time. Streamflow is above normal in a lot of cases, but this is obviously a measure that fluctuates based on precipitation and other factors. More importantly for long term favorably flow and temperature conditions, especially in our coldwater streams, the groundwater levels in most of the state have rebounded as well. 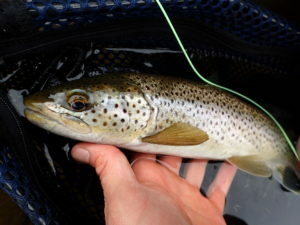 Second, although I’ve been holding off on trout posts, I’ve been getting out a ton and the fishing has been really pretty solid this spring – not so much for my warmwater fishing endeavors though (more on that later). I’ve been exploring a lot of new water and revisiting spots I fished last year. I’ve fished for trout more this year than I have since leaving the West almost eight years ago. Prior to moving here last year I lived in Ohio for six years and Minnesota for a year and a half. Neither of those states are renowned for their trout fishing. Minnesota isn’t bad, and Wisconsin is close, which is a very underrated trout state. 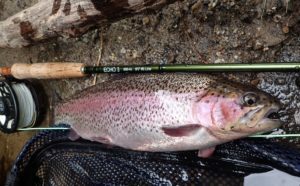 Ohio really only has one legitimate trout fishery, which by the way was created by chance when the Mad River was channelized and deepened to the point where the groundwater level was intercepted. 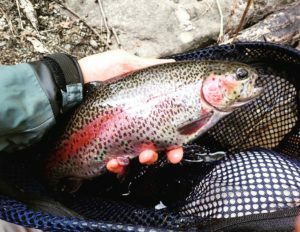 Since moving to Massachusetts and rekindling my trout fishing I’ve had to more-or-less relearn a lot of techniques while also finding spots to fish and learning about the bugs we have here in New England. It’s coming along but still a long way to go in this department. Been catching a mixture of stockies, holdovers, and potentially wild fish based on which rivers I’ve been targeting. 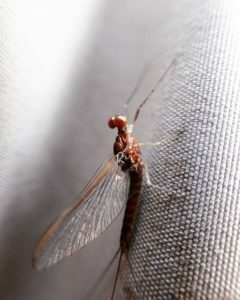 A few pictures below. Based on some discussion with Jo I think I’d like to start writing more about fish conservation issues and fish/aquatic ecology in general. I may not post specifically about these topics very often but I may attempt to integrate more of this type of material into my normal posts. 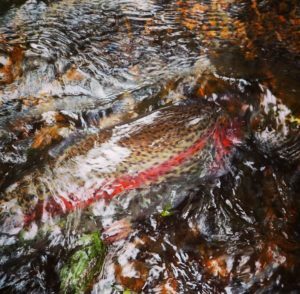 Initially, I have been thinking about writing a bit about stocked v. wild trout from an ecological perspective but also from a social perspective. As long as everyone can play nice (!) 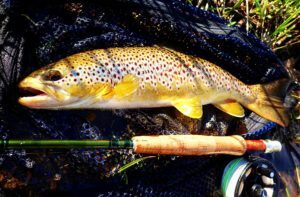 I’d love to recruit a couple of guest writers from among the regular blog readers who can write about their own perspective on the issue of stocked v. wild trout. Ideally it would be fun to have the guest bloggers represent opposite ends of the spectrum regarding their feelings towards these different types of fisheries. 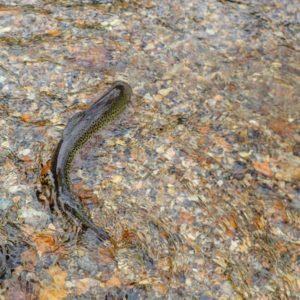 For example, one contributor would opine on the virtues of pursuing wild trout while the other writer would focus on why they feel stocked fish, and the fisheries they support, are beneficial. I think my role would then be to fill in the “grey area” and discuss the ecological implications. 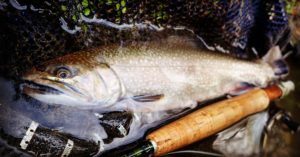 I would envision that the guest posts would be entirely positive in nature, they would emphasize how the authors felt about either wild or stocked trout fisheries and NOT their negative feelings towards the opposite perspective. For example, if writing about wild fish, the author would focus on that topic and not on bashing those who enjoy catching stocked fish. Could this be something of interest to everyone? Lastly, this cool spring weather has really been messing with the warmwater fishing. I went out today to have a look around and everything but a few hardy largemouths have all but abandoned the shallows. Admittedly this is a small sample size of just a couple of the ponds I frequent. The few bass I saw in shallow were basically comatose. I did not spot a carp anywhere. It seems to me that the weather has put everything on hold for the time being. Looks like next week should be much nicer so things are bound to pick up soon! Nice post! I recently moved from Ohio and spent a lot of time hitting the Mad and other river in the area. Yes, there is quite a lot to learn in the NE but the Mad was not as crowded as the Swift and Farmington. 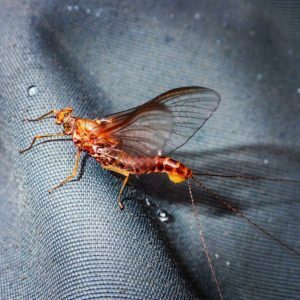 Plan to venture to the East Branch this season. Hi David, welcome to New England! There are plenty of rivers in the area that get little or no pressure. Many blue lines abound, particularly in the Berkshires or around the White Mountains. I do find the Farmington busy at times, but, as is usually the case, if you walk 5 min., you’ll be by yourself. Most of the older anglers hug the same few pools. This book, by Tom Fuller, is really good, FYI.